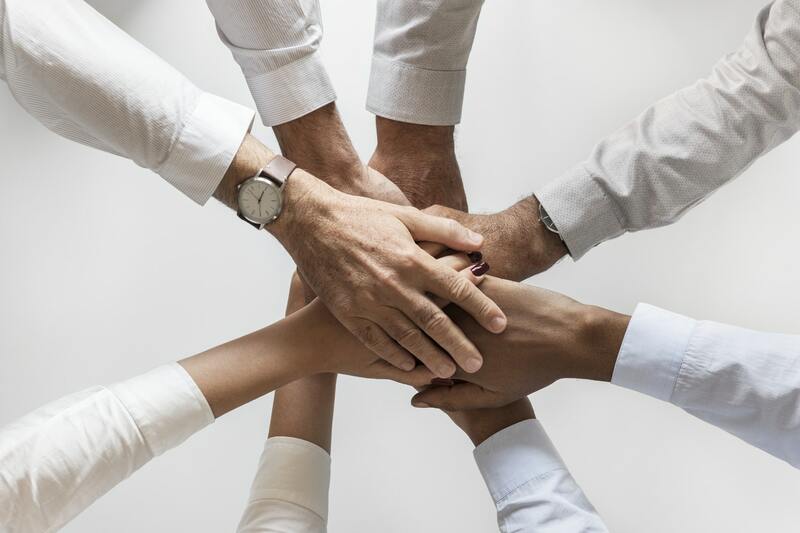 A Decentralized Autonomous Organization (DAO) is an organization that can fully function without the usual management structure that involves people. 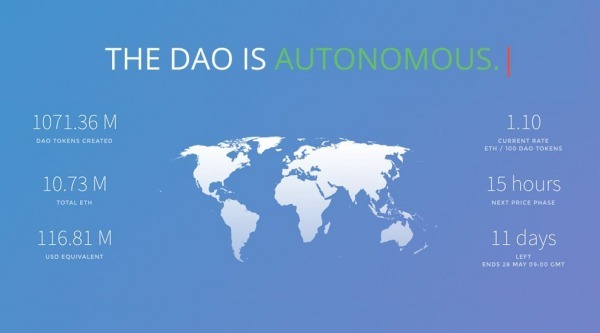 A DAO can also be defined as an organizational system that maintains and sustains itself based on smart contracts in which users determine its direction for the future by election. Imagine a washing machine that operates and maintains itself. All anybody has to do is to bring in the dirty clothes and take out the cleaned clothes. The system operates, gets the water, detergent (and the likes), carries out routine maintenance, all by itself. Every activity in its working cycle is already programmed. The users can then determine how they want the washing machine to improve with time by voting on proposals by other users on how to improve the code of the washing machine. This washing machine is an illustration of a DAO. A DAO has 3 core characteristics. First, it is a programmed set of rules. This set of rules is on a smart contract platform which exists on the internet as an open-source code. Second, it functions autonomously. This means that its day-to-day activities is purely based on the written code. Third, it is coordinated through a distributed consensus protocol. This means that decisions regarding the future of the platform is taken by the community of users according to the agreed initial plan. An important part of a DAO is the funding. A DAO is often funded by a crowdsale or (more popularly) by an ICO. The tokens issued by a DAO should have a use of some sort (to make the tokens worthy of constant transactions). Beyond this, the ability to influence the future of a DAO through voting is often determined by token ownership. Token ownership of a DAO basically means shareholder status. In many cases, the amount of tokens owned by an individual determines the voting power of the individual. Once a DAO is deployed it becomes completely independent. Even the founders and developers cannot claim ownership over it anymore. Also, the system becomes fully autonomous and open-source. All financial transactions and program rules are recorded on the blockchain. Decisions concerning how a DAO spends its money is reached via consensus. Anyone with the required stake can make proposals regarding the future of a DAO. However, to avoid spam, a monetary deposit may be required to make a proposal. It is important to note that a DAO cannot build products, write code or develop hardware. Contractors gets appointed for these by the consensus decision. The idea behind DAO began floating around after Bitcoin became successful. The concept was fueled by the idea of eliminating middlemen and creating complete transparency. However, it was Daniel Larimer who first proposed the concept of a Decentralized Organized Company in an article published September 7, 2013. Vitalik Buterin proposed that after a DAO is launched, it can be organized to run without human management, provided the smart contracts were supported by a Turing complete platform. Ethereum has been described as meeting that Turing threshold, thus enabling DAOs. The first DAO that came to life is known as The DAO. In June 2016, an antipattern in Solidity (the programming language of Ethereum) that could lead to attacks on smart contracts was discovered. This imperfection allowed large withdrawals from The DAO. On June 17, 2016, an anonymous hacker (or group of hackers) withdrew funds from The DAO into a childDAO. 3.5 million ETH (which is about $50 million then) was stolen. The reputation of Ethereum (as a hosting platform for DAO) was greatly affected by this hack. The concept of DAO also became subject to a lot of scrutiny. After much debate, the Ethereum community arrived at a consensus decision to hard fork the Ethereum blockchain to bail out the original contract. This failure shows the weakness of DAO and it is said to serve as a lesson for future DAOs. This is why sufficient time is allocated for testing codes and why programs like bug bounty exists in more recent DAOs. It is still unclear how to class DAO considering the current structure of regulations in the world. There is still the debate whether to class Bitcoin as a commodity or currency. Most projects in the cryptocurrency world are yet to have a definite status by the legal system. Most token holders do not understand (or are not interested in) the voting power of their tokens. This makes the number of voters in a consensus not so high. However, as crypto adoption widens, voting is expected to be taken more seriously. After the code is deployed, changes cannot be made to the code without a consensus. This means that if a bug is found on the code, the fix has to wait until a consensus is reached. This gives time for hackers to exploit the bug in the code. This was the situation with The DAO—even though the bug was spotted and those who can fix it were readily available, the community had to reach a consensus before any decision was taken. This made a lot of people watch helplessly as the hack continued because the hacker (or group of hackers) wasn’t doing anything technically wrong according to the code. Virtually all decentralized cryptocurrency networks are DAOs. They are all autonomous organizations with decentralized governance. However, their autonomy and decentralization can come into question based on their token use and token distribution. The Dash cryptocurrency works on a Proof-of-Work consensus. The DAO structure consists of miners, masternodes, and treasury. The miners run software to solve complex algorithms which creates new coins and run the network by processing transactions in exchange for nominal fees. They get 45% of block rewards. The masternode is the second layer of the network that deals with instant transactions and private transactions. Masternodes vote on protocol changes and distribution of the treasury. They also get 45% of block rewards. The treasury is a portion of new funds created which can be spent on anything subject to a masternode vote. A proposal for the Dash platform must include the text, Dash amount, and timeframe. A net 10% of masternodes have to approve it. Treasury gets up to 10% of block rewards. Digix Global plans to create a new cryptocurrency backed by actual bars of gold. DigixDAO is a decentralized group of participants that purchased the DGD tokens in a crowdsale on the Ethereum blockchain. They will make decisions about how to grow the Digix Global Ecosystem by voting on any proposals submitted to DigixDAO. As a reward for voting and decision making in the growth of Digix, DGD holders receive rewards in DGX, a token that represents 1 gram of gold. The consensus is Proof-of-Asset, a process that involves recording the possession of an asset on the Ethereum blockchain. BitShares is a distributed ledger and network based on the Delegated Proof-of-Stake algorithm. BitShares uses a system of delegates and witnesses to run the network. Witnesses validate signatures and timestamp transactions by including them in blocks. Witnesses are chosen via an election by stakeholders (which means BTS token owners). Delegates make changes to the network parameters by making a proposal that stakeholders will vote on (whether to allow or disallow). However, the more BTS a stakeholder has, the more weight of the vote of the stakeholder. Decentralized autonomous organizations have produced a way for blockchain technology to be well structured to stand the test of time. While hard lessons were learnt in its short history, it is likely that the future of DAOs will be brighter and better even as cryptocurrencies gain more adoption. DAO gives blockchain technology the ability to provide secure digital ledger to track financial interactions across the internet. Through timestamping and dissemination of a distributed database, a case of forgery is almost impossible. This makes DAO a compelling concept to keep an eye on. Related: What is a Stable Coin and Does the Crypto Market Need Them?